The late, great actor Robin Williams once said, “Spring is nature’s way of saying – Lets Party!”, and he is right. Spring is a time when the whole country celebrates weather. We resurrect those New Year Resolutions that have been dormant, oh since about January 10th. The dark days of winter are literally over and daylight savings has begun allowing many in the grind to enjoy some outdoor daylight after work. We all celebrate Mother Nature during spring and after this past winter, there is no better way than spring skiing. 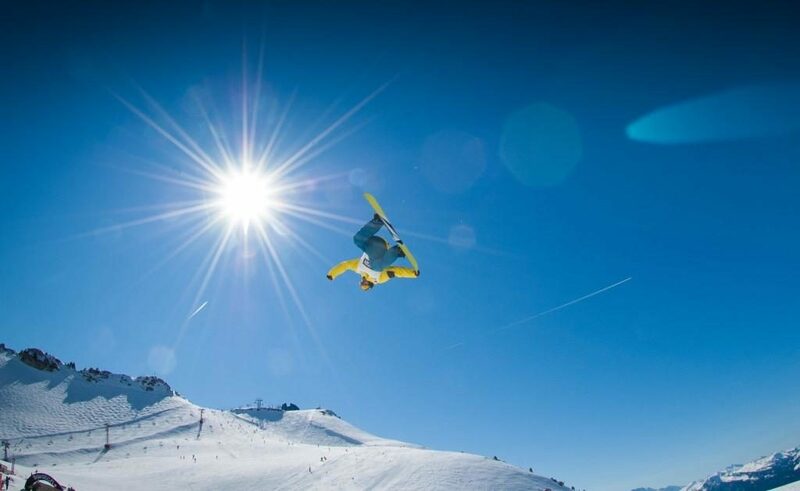 Reason 5 – We love spring skiing because its not cold! Lets be honest, powder days are epic but powder days when ice is sticking to your face and the chairlift is swinging is not fun. Skiing in warm weather has so many comfort advantages. For starters you can wear sunglasses instead of goggles. I always enjoy wearing my nice polarized beach shades vs big bulky goggles. You just feel more outdoors with less gear on your head. Same goes for your hat. During the spring you can pitch the hat and go without or wear your favorite baseball hat. Turn it backwards as you charge down the hill and turn it to the front when you are on the lift to protect your face from the powerful rays at 8000 feet. We love spring skiing because its warm. Reason 4 – We love spring skiing because there are no crowds. The shoulder seasons in the mountains are always the best. April is a great time to ski because all the weekend warriors are tired of driving to the mountains for the past three months. They are excited to stay home and do what they do – cleaning, gardening or eat and drink – America’s favorite pastime. This leaves the parking lots empty at ski resorts, which means no more hauling your gear a half mile to get to the lift. No more waiting in lift lines, food lines and most importantly at the bar, its go time! Spring skiing in some ways is the way resorts reward their most loyal followers, well at least the resorts outside of Utah that have some balls to stay open in April. We love spring skiing because there are no crowds. 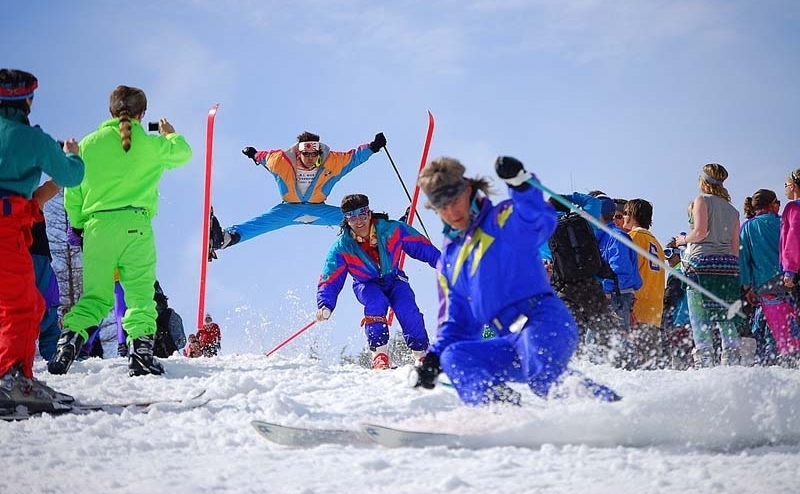 Reason 3 – We love spring skiing because of Retro Ski Day and Pond Skim. Most mountains have a day where all the skiers wear throwback or vintage ski sweaters, gators, CB Jackets & anything else from the 80s and 90s. 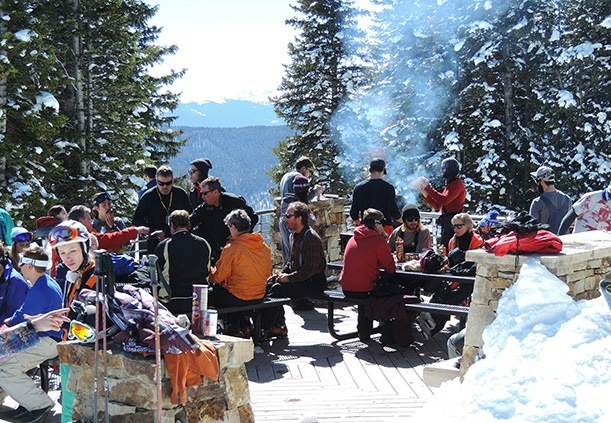 It’s a lot of fun and typically followed up with a band on a mountain patio. Many mountains schedule this for their closing day so you might have to ride out the season to enjoy Retro Day. 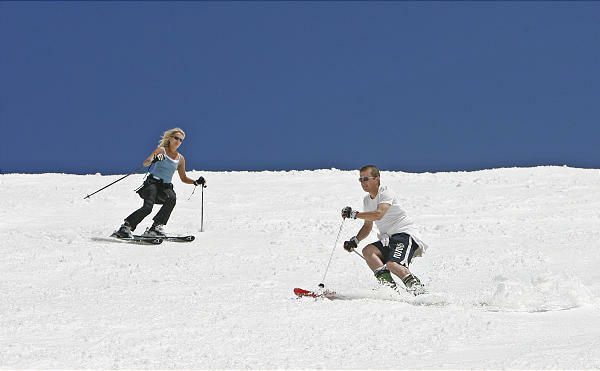 Any legit mountain will also throw in a pond skim, like the Cushing Crossing at Squaw Valley. 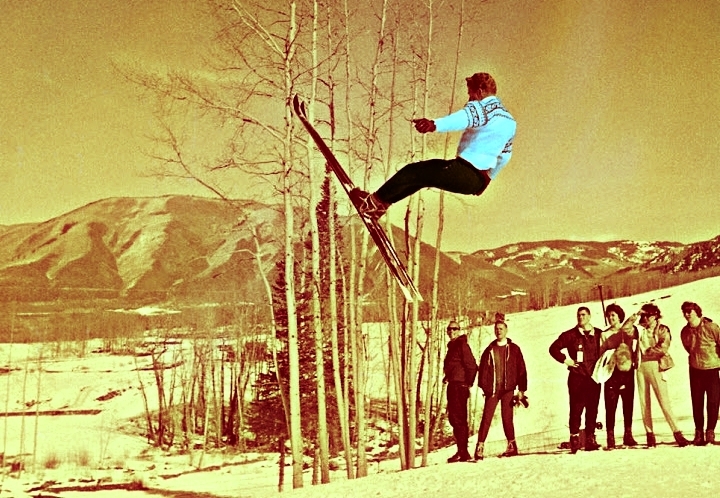 Reason 2 – We love spring skiing because its cheap. Many mountains have reduced prices in the spring and most allow you to ski April and May for free if you purchase a pass for the following season. That’s quite a deal when you consider a daily lift ticket at one of the major mountains in the US is around $130. If you can knock out 3-4 spring skiing days, come December your season pass is already half paid. Reason 1 – We love spring skiing because it’s a great opportunity to spend time with family and friends. There is no freezing wind battering your face. There are no snowbanks or shoveling duties. The roads are dry making the commute to the mountain super easy. There is hero snow all over the mountain allowing intermediate skiers to look and feel like experts. It’s just an easy time to be in the mountains without all the hustle. Back at the cabin you can drop a Duraflame log into the fireplace and fire up the grill on the deck. In the spring you can leave the sliding glass door open while you cook and entertain your guests. We love spring skiing because it’s Mother Nature’s way of saying “Lets spend some quality time together … and party!”. Thanks For Reading and Supporting Our Sponsors!